"Crispy Swedish cookies -- you can make these either almond or lemon flavored, depending on which kind of extract you use." Melt butter and let cool to room temperature. Cream with sugar until smooth and light yellow. Add almond extract and mix well. Sift flour and baking powder and add to mixture, mixing well. Knead dough lightly on board. Cover and refrigerate for one hour. Preheat oven to 300 degrees F (150 degrees C). Roll dough into a log 1 inch in diameter. Cut off slices 1/3 to 1/2 inch thick. Roll slices into balls and place on cookie sheet 1 1/2 inches apart. Slightly dent the top of each with fingertip. Bake 25 to 30 minutes, or until light golden in color. Light Dreams, the only thing I liked about this recipe was the time efficiency, otherwise very bland and boring. 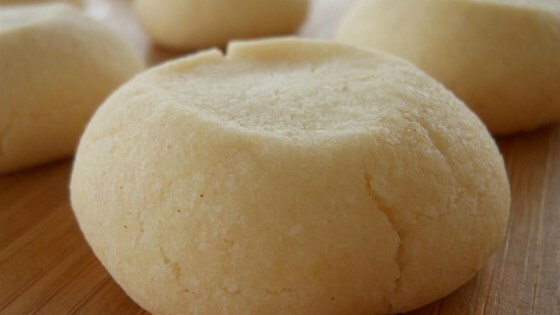 This simple cookie has been a Christmas staple for years at my house. It has a great almond flavor and is a classic! Best cookie recipe yet!! I subbed the butter for margarine and it worked great. So light and it does feel like eating a dream! 10/10 would recommend.